INKin' All Night! : Sale-A-Bration Time is Here!! It's that time of year! It's SALE-A-BRATION and our best time of the year! 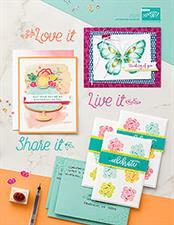 Enjoy FREE stamp rewards with qualifying purchases! Shop from the NEW Occasions Spring Catalog featuring tons of cute, new, fun and adorable stamp sets, designer series paper, embellishments and more!! The catalogs are posted online for download (PDF) and available in my online store as well! You may click on the links below to download them while you wait for a physical copy to arrive! As demonstrators we do pay for our mailings, both the catalog items themselves and the postage so I try to make sure to send to customers that are supporting my business by shopping with me for your stamping supplies. If you have shopped with me in the past year, you should be receiving a complimentary copy of these new catalogs any day! I missed my mailing cutoff, so they have been ordered and are being packaged up to mail out this weekend! If you are brand new to me and do not have a copy fron another demonstrator, please email me with your name and complete mailing address and I'll be happy to send you a set. I appreciate your support of my business - thank you very much! Happy SALE-A-BRATION and I can't wait to see and hear what you think is the cutest! !